Electric charge is the physical property of matter that causes it to experience a force when placed in an electromagnetic field. There are two-types of electric charges; positive and negative. Like charges repel and unlike attract. An object with an absence of net charge is referred to as neutral. Early knowledge of how charged substances interact is now called classical electrodynamics, and is still accurate for problems that do not require consideration of quantum effects. The elementary charge, usually denoted by e or sometimes qe, is the electric charge carried by a single proton or, equivalently, the magnitude of the electric charge carried by a single electron, which has charge −1 e. This elementary charge is a fundamental physical constant. To avoid confusion over its sign, e is sometimes called the elementary positive charge. The word proton is Greek for "first", and this name was given to the hydrogen nucleus by Ernest Rutherford in 1920. 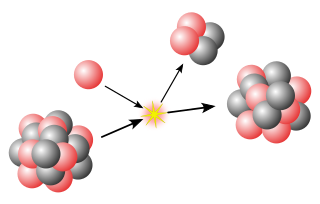 In previous years, Rutherford had discovered that the hydrogen nucleus (known to be the lightest nucleus) could be extracted from the nuclei of nitrogen by atomic collisions. Protons were therefore a candidate to be a fundamental particle, and hence a building block of nitrogen and all other heavier atomic nuclei. Ernest Rutherford, 1st Baron Rutherford of Nelson, HFRSE LLD, was a New Zealand-born British physicist who came to be known as the father of nuclear physics. Encyclopædia Britannica considers him to be the greatest experimentalist since Michael Faraday (1791–1867). In particle physics, a hadron is a composite particle made of two or more quarks held together by the strong force in a similar way as molecules are held together by the electromagnetic force. Most of the mass of ordinary matter comes from two hadrons, the proton and the neutron. A chemical compound is a chemical substance composed of many identical molecules composed of atoms from more than one element held together by chemical bonds. A chemical element bonded to an identical chemical element is not a chemical compound since only one element, not two different elements, is involved. A hydrogen atom is an atom of the chemical element hydrogen. The electrically neutral atom contains a single positively charged proton and a single negatively charged electron bound to the nucleus by the Coulomb force. Atomic hydrogen constitutes about 75% of the baryonic mass of the universe. In quantum mechanics, spin is an intrinsic property of all elementary particles. All known fermions, the particles that constitute ordinary matter, have a spin of 1/2. The spin number describes how many symmetrical facets a particle has in one full rotation; a spin of 1/2 means that the particle must be fully rotated twice before it has the same configuration as when it started. In 1917 (in experiments reported in 1919), Rutherford proved that the hydrogen nucleus is present in other nuclei, a result usually described as the discovery of protons. Rutherford had earlier learned to produce hydrogen nuclei as a type of radiation produced as a product of the impact of alpha particles on nitrogen gas, and recognize them by their unique penetration signature in air and their appearance in scintillation detectors. These experiments were begun when Rutherford had noticed that, when alpha particles were shot into air (mostly nitrogen), his scintillation detectors showed the signatures of typical hydrogen nuclei as a product. After experimentation Rutherford traced the reaction to the nitrogen in air, and found that when alphas were produced into pure nitrogen gas, the effect was larger. Rutherford determined that this hydrogen could have come only from the nitrogen, and therefore nitrogen must contain hydrogen nuclei. One hydrogen nucleus was being knocked off by the impact of the alpha particle, producing oxygen-17 in the process. This was the first reported nuclear reaction, 14N + α → 17O + p. (This reaction would later be observed happening directly in a cloud chamber in 1925). 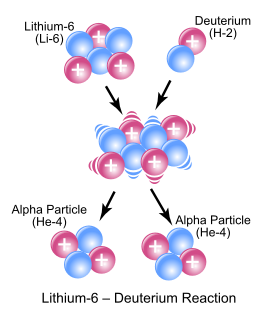 The internal dynamics of protons are complicated, because they are determined by the quarks' exchanging gluons, and interacting with various vacuum condensates. Lattice QCD provides a way of calculating the mass of a proton directly from the theory to any accuracy, in principle. The most recent calculations   claim that the mass is determined to better than 4% accuracy, even to 1% accuracy (see Figure S5 in Dürr et al. ). These claims are still controversial, because the calculations cannot yet be done with quarks as light as they are in the real world. This means that the predictions are found by a process of extrapolation, which can introduce systematic errors. It is hard to tell whether these errors are controlled properly, because the quantities that are compared to experiment are the masses of the hadrons, which are known in advance. These recent calculations are performed by massive supercomputers, and, as noted by Boffi and Pasquini: "a detailed description of the nucleon structure is still missing because ... long-distance behavior requires a nonperturbative and/or numerical treatment..."  More conceptual approaches to the structure of protons are: the topological soliton approach originally due to Tony Skyrme and the more accurate AdS/QCD approach that extends it to include a string theory of gluons,  various QCD-inspired models like the bag model and the constituent quark model, which were popular in the 1980s, and the SVZ sum rules, which allow for rough approximate mass calculations. These methods do not have the same accuracy as the more brute-force lattice QCD methods, at least not yet. However, in 2010 an international research team published a proton charge radius measurement via the Lamb shift in muonic hydrogen (an exotic atom made of a proton and a negatively charged muon). As a muon is 200 times heavier than an electron, its de Broglie wavelength is correspondingly shorter. This smaller atomic orbital is much more sensitive to the proton's charge radius, so allows more precise measurement. Their measurement of the root-mean-square charge radius of a proton is "6984841840000000000♠0.84184(67) fm, which differs by 5.0 standard deviations from the CODATA value of 6984876800000000000♠0.8768(69) fm". In January 2013, an updated value for the charge radius of a proton—6984840870000000000♠0.84087(39) fm—was published. The precision was improved by 1.7 times, increasing the significance of the discrepancy to 7σ. The 2014 CODATA adjustment slightly reduced the recommended value for the proton radius (computed using electron measurements only) to 6984875100000000000♠0.8751(61) fm, but this leaves the discrepancy at 5.6σ. 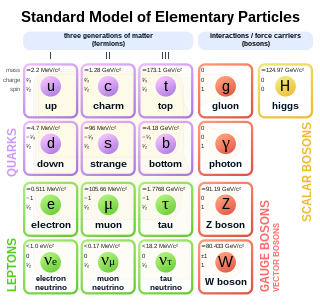 Since the proton is composed of quarks confined by gluons, an equivalent pressure which acts on the quarks can be defined. This allows calculation of their distribution as a function of distance from the centre using Compton scattering of high-energy electrons (DVCS, for deeply virtual Compton scattering). The pressure is maximum at the centre, about 1035 Pa which is greater than the pressure inside a neutron star. It is positive (repulsive) to a radial distance of about 0.6 fm, negative (attractive) at greater distances, and very weak beyond about 2 fm. Research has been performed on the dose-rate effects of protons, as typically found in space travel, on human health. To be more specific, there are hopes to identify what specific chromosomes are damaged, and to define the damage, during cancer development from proton exposure. Another study looks into determining "the effects of exposure to proton irradiation on neurochemical and behavioral endpoints, including dopaminergic functioning, amphetamine-induced conditioned taste aversion learning, and spatial learning and memory as measured by the Morris water maze. Electrical charging of a spacecraft due to interplanetary proton bombardment has also been proposed for study. There are many more studies that pertain to space travel, including galactic cosmic rays and their possible health effects, and solar proton event exposure. CPT-symmetry puts strong constraints on the relative properties of particles and antiparticles and, therefore, is open to stringent tests. For example, the charges of a proton and antiproton must sum to exactly zero. This equality has been tested to one part in 7008100000000000000♠108. The equality of their masses has also been tested to better than one part in 7008100000000000000♠108. By holding antiprotons in a Penning trap, the equality of the charge-to-mass ratio of protons and antiprotons has been tested to one part in 7009600000000000000♠6×109. The magnetic moment of antiprotons has been measured with error of 6997800000000000000♠8×10−3 nuclear Bohr magnetons, and is found to be equal and opposite to that of a proton. In nuclear physics, beta decay (β-decay) is a type of radioactive decay in which a beta ray is emitted from an atomic nucleus. For example, beta decay of a neutron transforms it into a proton by the emission of an electron accompanied by an antineutrino, or conversely a proton is converted into a neutron by the emission of a positron with a neutrino, thus changing the nuclide type. Neither the beta particle nor its associated (anti-)neutrino exist within the nucleus prior to beta decay, but are created in the decay process. By this process, unstable atoms obtain a more stable ratio of protons to neutrons. The probability of a nuclide decaying due to beta and other forms of decay is determined by its nuclear binding energy. The binding energies of all existing nuclides form what is called the nuclear band or valley of stability. For either electron or positron emission to be energetically possible, the energy release or Q value must be positive. The muon is an elementary particle similar to the electron, with an electric charge of −1 e and a spin of 1/2, but with a much greater mass. It is classified as a lepton. As is the case with other leptons, the muon is not believed to have any sub-structure—that is, it is not thought to be composed of any simpler particles. Nuclear physics is the field of physics that studies atomic nuclei and their constituents and interactions. Other forms of nuclear matter are also studied. Nuclear physics should not be confused with atomic physics, which studies the atom as a whole, including its electrons. In particle physics, the strong interaction is the mechanism responsible for the strong nuclear force (also called the strong force, nuclear strong force, or colour force), and is one of the four known fundamental interactions, with the others being electromagnetism, the weak interaction, and gravitation. At the range of 10−15 m (1 femtometer), the strong force is approximately 137 times as strong as electromagnetism, a million times as strong as the weak interaction, and 1038 times as strong as gravitation. The strong nuclear force holds most ordinary matter together because it confines quarks into hadron particles such as the proton and neutron. In addition, the strong force binds neutrons and protons to create atomic nuclei. Most of the mass of a common proton or neutron is the result of the strong force field energy; the individual quarks provide only about 1% of the mass of a proton. The nuclear force is a force that acts between the protons and neutrons of atoms. Neutrons and protons, both nucleons, are affected by the nuclear force almost identically. Since protons have charge +1 e, they experience an electric force that tends to push them apart, but at short range the attractive nuclear force is strong enough to overcome the electromagnetic force. The nuclear force binds nucleons into atomic nuclei. The neutron magnetic moment is the intrinsic magnetic dipole moment of the neutron, symbol μn. Protons and neutrons, both nucleons, comprise the nucleus of atoms, and both nucleons behave as small magnets whose strengths are measured by their magnetic moments. The neutron interacts with normal matter through either the nuclear force or its magnetic moment. The neutron's magnetic moment is exploited to probe the atomic structure of materials using scattering methods and to manipulate the properties of neutron beams in particle accelerators. The neutron was determined to have a magnetic moment by indirect methods in the mid 1930s. Luis Alvarez and Felix Bloch made the first accurate, direct measurement of the neutron's magnetic moment in 1940. The existence of the neutron's magnetic moment indicates the neutron is not an elementary particle. For an elementary particle to have an intrinsic magnetic moment, it must have both spin and electric charge. The neutron has spin 1/2 ħ, but it has no net charge. The existence of the neutron's magnetic moment was puzzling and defied a correct explanation until the quark model for particles was developed in the 1960s. 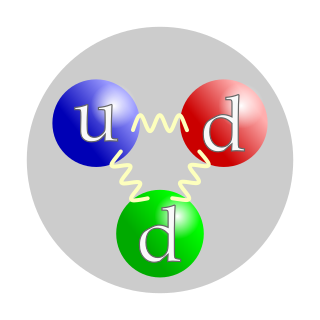 The neutron is composed of three quarks, and the magnetic moments of these elementary particles combine to give the neutron its magnetic moment. The rms charge radius is a measure of the size of an atomic nucleus, particularly of a proton or a deuteron. It can be measured by the scattering of electrons by the nucleus and also inferred from the effects of finite nuclear size on electron energy levels as measured in atomic spectra. The discovery of the neutron and its properties was central to the extraordinary developments in atomic physics in the first half of the 20th century. Early in the century, Ernest Rutherford developed a crude model of the atom, based on the gold foil experiment of Hans Geiger and Ernest Marsden. In this model, atoms had their mass and positive electric charge concentrated in a very small nucleus. By 1920 chemical isotopes had been discovered, the atomic masses had been determined to be (approximately) integer multiples of the mass of the hydrogen atom, and the atomic number had been identified as the charge on the nucleus. Throughout the 1920s, the nucleus was viewed as composed of combinations of protons and electrons, the two elementary particles known at the time, but that model presented several experimental and theoretical contradictions. 1 2 3 4 5 6 7 Mohr, P.J. ; Taylor, B.N. and Newell, D.B. (2015), "The 2014 CODATA Recommended Values of the Fundamental Physical Constants", National Institute of Standards and Technology, Gaithersburg, MD, US. ↑ "proton | Definition, Mass, Charge, & Facts". Encyclopedia Britannica. Retrieved 2018-10-20. ↑ Cho, Adrian (2 April 2010). "Mass of the Common Quark Finally Nailed Down". Science Magazine. American Association for the Advancement of Science. Retrieved 27 September 2014. ↑ "Proton size puzzle reinforced!". Paul Shearer Institute. 25 January 2013. ↑ Antognini; et al. (Jan 2013). "Proton Structure from the Measurement of 2S-2P Transition Frequencies of Muonic Hydrogen" (PDF). Science. 339 (6118): 417–420. Bibcode:2013Sci...339..417A. doi:10.1126/science.1230016. hdl:10316/79993. PMID 23349284. ↑ Adair, R.K. (1989). The Great Design: Particles, Fields, and Creation. Oxford University Press. p. 214. Bibcode:1988gdpf.book.....A. ↑ Basdevant, J.-L.; Rich, J.; M. Spiro (2005). Fundamentals in Nuclear Physics. Springer. p. 155. ISBN 978-0-387-01672-6. ↑ Department of Chemistry and Biochemistry UCLA Eric R. Scerri Lecturer (2006-10-12). 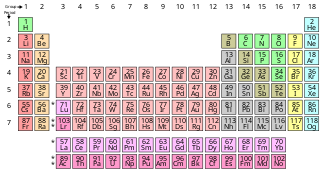 The Periodic Table : Its Story and Its Significance: Its Story and Its Significance. Oxford University Press. ISBN 978-0-19-534567-4. ↑ Wilhelm Wien: Über positive Elektronen und die Existenz hoher Atomgewichte. In: Annalen der Physik. Band 318 (4), 1904, S. 669–677. ↑ Petrucci, R.H.; Harwood, W.S. ; Herring, F.G. (2002). General Chemistry (8th ed.). p. 41. ↑ Romer A (1997). "Proton or prouton? Rutherford and the depths of the atom". Am. J. Phys. 65 (8): 707. Bibcode:1997AmJPh..65..707R. doi:10.1119/1.18640. ↑ Rutherford reported acceptance by the British Association in a footnote to Masson, O. (1921). "XXIV. The constitution of atoms". Philosophical Magazine. Series 6. 41 (242): 281–285. doi:10.1080/14786442108636219. ↑ Pais, A. (1986) Inward Bound, Oxford Press, ISBN 0198519974, p. 296. Pais believed the first science literature use of the word proton occurs in "Physics at the British Association". Nature. 106 (2663): 357–358. 1920. Bibcode:1920Natur.106..357.. doi:10.1038/106357a0. ↑ Köhn, C.; Ebert, U. (2015). "Calculation of beams of positrons, neutrons and protons associated with terrestrial gamma-ray flashes". J. Geophys. Res. Atmospheres . 23 (4): 1620–1635. Bibcode:2015JGRD..120.1620K. doi:10.1002/2014JD022229. ↑ Köhn, C.; Diniz, G.; Harakeh, Muhsin (2017). "Production mechanisms of leptons, photons, and hadrons and their possible feedback close to lightning leaders". J. Geophys. Res. Atmospheres . 122 (2): 1365–1383. Bibcode:2017JGRD..122.1365K. doi:10.1002/2016JD025445. PMC 5349290 . PMID 28357174. ↑ Popkin, Gabriel (20 July 2017). "Surprise! The proton is lighter than we thought". Science . ↑ Heiße, F.; Köhler-Langes, F.; Rau, S.; Hou, J.; Junck, S.; Kracke, A.; Mooser, A.; Quint, W.; Ulmer, S.; Werth, G.; Blaum, K.; Sturm, S. (18 July 2017). "High-Precision Measurement of the Proton's Atomic Mass". Physical Review Letters . 119 (3): 033001. arXiv: 1706.06780 . Bibcode:2017PhRvL.119c3001H. doi:10.1103/PhysRevLett.119.033001. PMID 28777624. ↑ Buccella, F.; Miele, G.; Rosa, L.; Santorelli, P.; Tuzi, T. (1989). "An upper limit for the proton lifetime in SO(10)". Physics Letters B. 233 (1–2): 178–182. Bibcode:1989PhLB..233..178B. doi:10.1016/0370-2693(89)90637-0. ↑ Lee, D.G. ; Mohapatra, R.; Parida, M.; Rani, M. (1995). "Predictions for the proton lifetime in minimal nonsupersymmetric SO(10) models: An update". Physical Review D. 51 (1): 229–235. arXiv: hep-ph/9404238 . Bibcode:1995PhRvD..51..229L. doi:10.1103/PhysRevD.51.229. ↑ "Proton lifetime is longer than 1034 years". Kamioka Observatory. November 2009. ↑ Nishino, H.; Clark, S.; Abe, K.; Hayato, Y.; Iida, T.; Ikeda, M.; Kameda, J.; Kobayashi, K.; Koshio, Y.; Miura, M.; Moriyama, S.; Nakahata, M.; Nakayama, S.; Obayashi, Y.; Ogawa, H.; Sekiya, H.; Shiozawa, M.; Suzuki, Y.; Takeda, A.; Takenaga, Y.; Takeuchi, Y.; Ueno, K.; Ueshima, K.; Watanabe, H.; Yamada, S.; Hazama, S.; Higuchi, I.; Ishihara, C.; Kajita, T.; et al. (2009). "Search for Proton Decay via p→e+π0 and p→μ+π0 in a Large Water Cherenkov Detector". Physical Review Letters. 102 (14): 141801. arXiv: 0903.0676 . Bibcode:2009PhRvL.102n1801N. doi:10.1103/PhysRevLett.102.141801. PMID 19392425. ↑ Ahmed, S.; Anthony, A.; Beier, E.; Bellerive, A.; Biller, S.; Boger, J.; Boulay, M.; Bowler, M.; Bowles, T.; Brice, S.; Bullard, T.; Chan, Y.; Chen, M.; Chen, X.; Cleveland, B.; Cox, G.; Dai, X.; Dalnoki-Veress, F.; Doe, P.; Dosanjh, R.; Doucas, G.; Dragowsky, M.; Duba, C.; Duncan, F.; Dunford, M.; Dunmore, J.; Earle, E.; Elliott, S.; Evans, H.; et al. (2004). "Constraints on Nucleon Decay via Invisible Modes from the Sudbury Neutrino Observatory". Physical Review Letters. 92 (10): 102004. arXiv: hep-ex/0310030 . Bibcode:2004PhRvL..92j2004A. doi:10.1103/PhysRevLett.92.102004. PMID 15089201. ↑ Watson, A. (2004). The Quantum Quark. Cambridge University Press. pp. 285–286. ISBN 978-0-521-82907-6. ↑ Timothy Paul Smith (2003). Hidden Worlds: Hunting for Quarks in Ordinary Matter. Princeton University Press. Bibcode:2003hwhq.book.....S. ISBN 978-0-691-05773-6. ↑ Weise, W.; Green, A.M. (1984). Quarks and Nuclei. World Scientific. pp. 65–66. ISBN 978-9971-966-61-4. ↑ Ball, Philip (Nov 20, 2008). "Nuclear masses calculated from scratch". Nature. Retrieved Aug 27, 2014. ↑ Reynolds, Mark (Apr 2009). "Calculating the Mass of a Proton". CNRS International Magazine (13). ISSN 2270-5317 . Retrieved Aug 27, 2014. 1 2 Durr, S.; Fodor, Z.; Frison, J.; Hoelbling, C.; Hoffmann, R.; Katz, S.D. ; Krieg, S.; Kurth, T.; Lellouch, L.; Lippert, T.; Szabo, K.K. ; Vulvert, G. (2008). "Ab Initio Determination of Light Hadron Masses". Science. 322 (5905): 1224–1227. arXiv: 0906.3599 . Bibcode:2008Sci...322.1224D. CiteSeerX 10.1.1.249.2858 . doi:10.1126/science.1163233. PMID 19023076. ↑ Perdrisat, C.F. ; Punjabi, V.; Vanderhaeghen, M. (2007). "Nucleon electromagnetic form factors". Progress in Particle and Nuclear Physics. 59 (2): 694–764. arXiv: hep-ph/0612014 . Bibcode:2007PrPNP..59..694P. doi:10.1016/j.ppnp.2007.05.001. ↑ Boffi, Sigfrido; Pasquini, Barbara (2007). "Generalized parton distributions and the structure of the nucleon". Rivista del Nuovo Cimento . 30 (9): 387. arXiv: 0711.2625 . Bibcode:2007NCimR..30..387B. doi:10.1393/ncr/i2007-10025-7. ↑ Joshua, Erlich (December 2008). "Recent Results in AdS/QCD". Proceedings, 8th Conference on Quark Confinement and the Hadron Spectrum, September 1–6, 2008, Mainz, Germany. arXiv: 0812.4976 . Bibcode:2008arXiv0812.4976E. ↑ Pietro, Colangelo; Alex, Khodjamirian (October 2000). "QCD Sum Rules, a Modern Perspective". In Shifman, M. (ed.). At the Frontier of Particle Physics / Handbook of QCD. At the Frontier of Particle Physics: Handbook of Qcd (In 3 Vols). Edited by Shifman M. Published by World Scientific Publishing Co. Pte. Ltd. pp. 1495–1576. arXiv: hep-ph/0010175 . Bibcode:2001afpp.book.1495C. CiteSeerX 10.1.1.346.9301 . doi:10.1142/9789812810458_0033. ISBN 978-981-02-4445-3. ↑ Pohl, Randolf; Antognini, Aldo; Nez, François; et al. (8 July 2010). "The size of the proton". Nature. 466 (7303): 213–216. Bibcode:2010Natur.466..213P. doi:10.1038/nature09250. PMID 20613837. ↑ Antognini, Aldo; Nez, François; Schuhmann, Karsten; et al. (25 January 2013). "Proton Structure from the Measurement of 2S-2P Transition Frequencies of Muonic Hydrogen". Science. 339 (6118): 417–420. Bibcode:2013Sci...339..417A. doi:10.1126/science.1230016. hdl:10316/79993. PMID 23349284. ↑ "The Proton Just Got Smaller". Photonics.Com. 12 July 2010. Retrieved 2010-07-19. ↑ Conover, Emily (2017-04-18). "There's still a lot we don't know about the proton". Science News. Retrieved 2017-04-29. 1 2 Carlson, Carl E. (May 2015). "The proton radius puzzle". Progress in Particle and Nuclear Physics. 82: 59–77. arXiv: 1502.05314 . Bibcode:2015PrPNP..82...59C. doi:10.1016/j.ppnp.2015.01.002. ↑ V.D. Burkert; L. Elouadrhiri; F.X. Girod (16 May 2018). "The pressure distribution inside the proton". Nature. 557 (7705): 396–399. Bibcode:2018Natur.557..396B. doi:10.1038/s41586-018-0060-z. PMID 29769668. ↑ Headrick, J.M. ; Diken, E.G. ; Walters, R.S. ; Hammer, N.I. ; Christie, R.A.; Cui, J.; Myshakin, E.M.; Duncan, M.A. ; Johnson, M.A. ; Jordan, K.D. (2005). "Spectral Signatures of Hydrated Proton Vibrations in Water Clusters". Science. 308 (5729): 1765–1769. Bibcode:2005Sci...308.1765H. doi:10.1126/science.1113094. PMID 15961665. 1 2 "Apollo 11 Mission". Lunar and Planetary Institute. 2009. Retrieved 2009-06-12. 1 2 3 "Space Travel and Cancer Linked? Stony Brook Researcher Secures NASA Grant to Study Effects of Space Radiation". Brookhaven National Laboratory. 12 December 2007. Retrieved 2009-06-12. 1 2 Shukitt-Hale, B.; Szprengiel, A.; Pluhar, J.; Rabin, B.M. ; Joseph, J.A. "The effects of proton exposure on neurochemistry and behavior". Elsevier/COSPAR . Retrieved 2009-06-12. ↑ Green, N.W. ; Frederickson, A.R. (2006). "A Study of Spacecraft Charging due to Exposure to Interplanetary Protons" (PDF). Space Technology and Applications International Forum - Staif 2006. 813: 694–700. Bibcode:2006AIPC..813..694G. CiteSeerX 10.1.1.541.4495 . doi:10.1063/1.2169250. Archived from the original (PDF) on 2010-05-27. Retrieved 2009-06-12. ↑ Planel, H. (2004). Space and life: an introduction to space biology and medicine. CRC Press. pp. 135–138. ISBN 978-0-415-31759-7. ↑ Gabrielse, G. (2006). "Antiproton mass measurements". International Journal of Mass Spectrometry . 251 (2–3): 273–280. Bibcode:2006IJMSp.251..273G. doi:10.1016/j.ijms.2006.02.013. Wikimedia Commons has media related to Proton .